Electronic health records (EHR) are the digital version of a patient’s medical history, which is maintained by the healthcare provider over time, and may include all of the key executives’ clinical data relevant to that individual care under a particular provider. EHRs include data ranging from demographics, problems, progress notes, vital signs, medications, past medical history, immunizations, radiology reports, to laboratory data. Over the past two decades, information technology (IT) has revolutionized every facet of the global healthcare industry. The vast adoption of IT and digital infrastructure in the healthcare industry has made information both a benefit and a challenge for every provider. Awareness about the disease and treatment is saving lives, while lack of effectively managed data might place this information at risk. Nevertheless, several pilot and cohort studies are being undertaken by government organizations and institutions pertaining to effectiveness of a computerized patient healthcare information systems and EHRs are increasingly replacing manually filled paper sheets, medical images, and other documents concerned with a patient’s healthcare history. Transparency Market Research estimates that the global electronic health records market, which was pegged at US$ 23.22 bn in 2016, will exhibit a promising 5.7% CAGR from 2017 to 2025 and rise to a valuation of US$38.29 bn by 2025. Web-based EHR systems are popular among medical professionals because these reduce deployment costs. On the other hand, client-server based EHR systems have up-front installation fees, which acts as a major restraint among small and mid-size practices. However, client-server based EHR systems help gain more control on both the software as well as the data. Web-based EHR systems, on the other hand, help reduce cost and the data is backed up automatically by the vendor. The software as a service (SaaS) segment is likely to grow at a rapid pace during the forecast period i.e. 2017 to 2025. Software as a service (SaaS) is gaining higher preference among physicians as it eliminates technical glitches and offer low upfront costs. The data can be accessed from anywhere in the world. Software as a service EHR systems are typically beneficial for standalone centers or older physicians who are in the industry for few years in order to avoid the penalty charges by the Centers for Medicare & Medicaid Services. The e-Health market has evolved as one of the fastest growing U.S. industries and remained almost unaffected even post-recession scenarios. Owing to this, North America accounted for lion’s share in the global EHR market driven on the back of government funding encouraging the meaningful use of certified electronic health record (EHR) technology across health care facilities, increasing pressure for health care cost containment, and rising demand for improved quality of health care services are the key factors boosting the growth of the North America EHR market. Europe and Asia Pacific are also among the leading contributors of revenue to the global EHR market. The U.K. and Germany are the key EHR markets in Europe, attributed to the rapidly increasing geriatric population, growing need for remote monitoring, increased pressure of health care cost containment, and increasing demand for improved patient care. The Asia-Pacific is witnessing increasing adoption of EHR across hospitals, physician offices, and other health care centers and is driven by the presence of a large pool of patients. Some of the leading players operating in the global electronic health record market are Allscripts Healthcare Solutions, Inc., Athenahealth, Inc., Cerner Corporation, CPSI, Epic Systems, eClinicalWorks, GE Healthcare, Greenway Health, LLC, Medical Information Technology, Inc., McKesson Corporation, NextGen Healthcare, and 4medica. Electronic Health Record (EHR) is a digital version of a patient’s medical history, which is maintained by the healthcare provider over time, and may include all of the key executives clinical data relevant to that individual care under a particular provider, including demographics, problems, progress notes, vital signs, medications, past medical history, immunizations, radiology reports and laboratory data. Dramatic improvement in the electronic health record system will increase demand globally. The report analyzes each of the segments and its sub-categories in detail for market trends, recent developments, outlook, and opportunities. The market overview section of the report explores market dynamics such as drivers, restraints, and opportunities that currently have strong impact on the global EHR market and could influence the market in the future as well. Market attractiveness analysis has been provided in the market overview section in order to explain the intensity of competition between leading market players operating across the globe. The report also mentioned about leading players for each of the product segment/technology that dominates the market or expected to emerge in forthcoming years. The research methodology is a combination of primary and secondary research. Primary research includes information collected via e-mails, and telephonic interviews of Key Opinion Leaders (KOL), and forms the bulk of our research. Secondary research includes information collected from various sources, by study of company websites, annual reports, stock analysis presentations, press releases, and various national and international databases. All these factors would help market players to take strategic decisions in order to strengthen their positions and expand their respective market shares. The recommendations section included in the report would assist existing market players in targeting all major stake holders of this industry such as companies, hospitals, emergency, assisted living facilities, home care providers government agencies and also to those aiming to seek an entry. 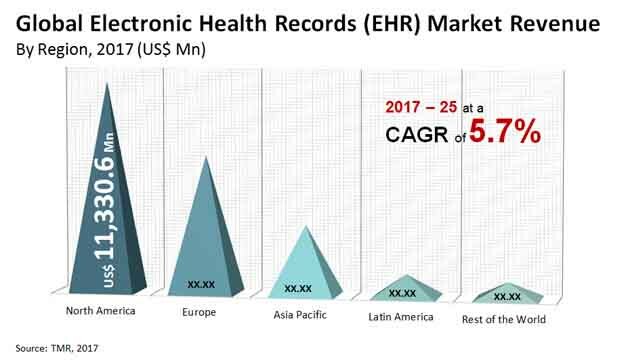 The report also profiles major players in the global EHR market based on various attributes such as company details, business overview, details of EHR business, financial details, business strategies and recent developments. Additional information such as vital components of EHR, hosting platforms, application areas of EHR, and legal requirements are covered in the market overview chapter which provide every minute details to assist new and existing players to venture and explore latent market opportunities in forthcoming years. The report also featured a detailed list of major revenue contributing EHR products, their certification, and manufacturer details to depict competition in the market. Based on installation type, global electronic health records market are segmented into web based, client server based and software-as-a-service. Based on end user, the electronic health records market are segmented into hospital, physician office, ambulatory surgical centers and others. Key players profiled in the electronic health record market study encompasses Allscripts Healthcare Solutions, Inc., Athenahealth, Inc., Cerner Corporation, CPSI, Epic Systems, eClinicalWorks, GE Healthcare, Greenway Health, LLC, Medical Information Technology, Inc., McKesson Corporation, NextGen Healthcare and 4medica.